The notoriously competitive refrigerator category has recently seen a number of new model launches from popular brands like Fischer & Paykel, Westinghouse and Samsung. At the same time smaller brands like Beko, Hisense and Mitsubishi are increasing their market share. Against this backdrop, LG was under pressure to launch a market-leading product capable of standing out from the crowd. The solution was their first 4.5 star energy rated bottom mount fridge. Our task was to clearly communicate its environmental and cost saving benefits. To cut through in this competitive category, we had to be single minded, leaving our target audience in no doubt that LG’s new 4.5 star rated fridge was good for saving on energy bills. Our campaign had to be eye catching, memorable and engaging across multiple channels. 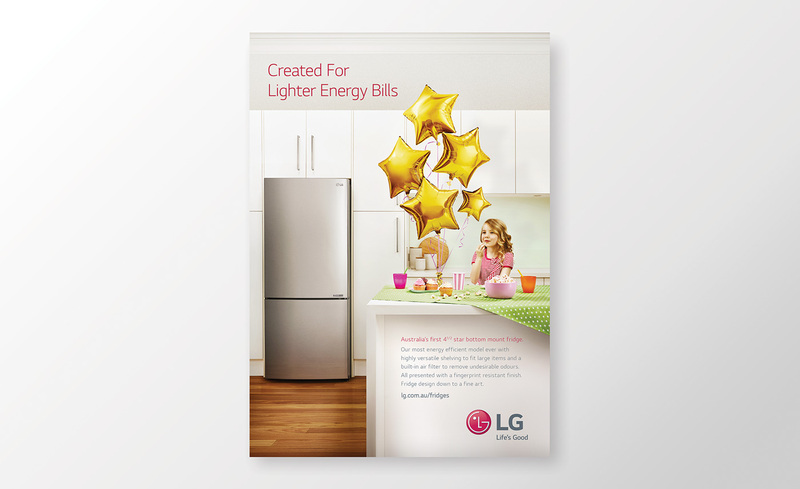 We created a campaign that highlighted ‘lighter energy bills’ while also clearly communicating the best-ever star rating for this bottom mount fridge. Our solution was to hero both of these benefits using gold star helium balloons in a birthday party setting. This visual device gave our advertising a premium feel and lent itself perfectly to visually arresting point of sale and digital banners.